It was great to see more coverage of Fairtrade produce being sold at local businesses. Oasis The Coffee House on the Leigh Road, Leigh-on-Sea was featured in the 28 January 2010 edition of the Essex Enquirer Newspaper. Thanks for the coverage guys! And great stuff Oasis The Coffee House. Southend: Are you ready for the Big Swap? We've just launched The Big Swap website, packed with lots of resources to download and use to help us reach our target of one million and one swaps to Fairtrade certified products during Fairtrade Fortnight - 22 February to 7 March. Watch films and read more about The Big Swap then start using posters and action guides to help us spread the word. The Fairtrade range started small. Like one bar of chocolate small. Now there are over 4,500 products bearing the FAIRTRADE Mark. A glorious array of products that spans pineapples and footballs to duvets and rice. Find out more about food & drink, beauty products, clothing and other bits and pieces you can swap today! The Big Swap website's a great way to make sure everyone hears about any event you might be organising for Fairtrade Fortnight. Get your details listed now so people can see it on our calendar and make sure they'll be there on the day. Great news! Southend High School For Boys (SHSB) are the latest School in the Borough of Southend to lend their support of the Fairtrade cause. A Fairtrade committee has been formed at the school form pupils and staff. They are now busy planning their first event and awareness raiser with a Fairtrade wine tasting soiree for Staff. That is sure to get more people on board supporting and understanding the importance of choosing Fairtrade. 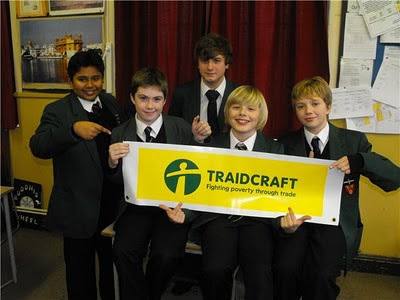 "Southend High are endeavouring to change the unfortunate truth of the lack of Faritrade in society and have recently set up a Fairtrade committee, a few of the younger members are in the photo above. It is up to these few pupils to work hard and bring the coveted status home and make SHSB a Fairtrade school. These efforts will also help Southend Borough who are also trying for this title." If your schools wants to join in and help the cause, please visit www.fairtrade.org.uk/schools for more information. A CYCLE shop in Leigh is the latest business to lend their support to the Leigh-on-Sea Fairtrade Town & Southend Borough Council Campaign. 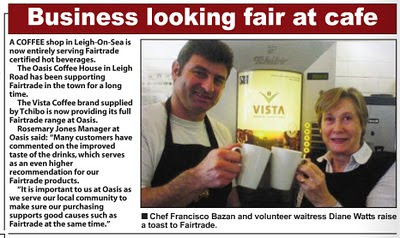 Oasis The Coffee House, 189 Leigh Road have long been supporters of Fairtrade in our town. They are now delighted to announce their new Bean to Cup Coffee Machine is now entirely serving Fairtrade certified hot beverages. Not only are all the popular styles of fresh coffee available but also Fairtrade Hot Chocolate and the Tea. Paco and Diane staff and volunteers at Oasis The Coffee House, run by Leigh Road Baptist Church raised a mug to this positive change that will make a massive difference to farmers in developing countries. The Vista Coffee brand supplied by Tchibo is now providing its full range at Oasis. Many customers have commented on the improved taste of the coffee, which serves as an even higher recommendation for Fairtrade marked products showing quality and care. Fairtrade supports farmers in developing countries and enables them to have a better future. The independent certification company FLO-CERT GmbH ensures adherence to the international Fairtrade standards. For this purpose, FLO-CERT employs over 70 inspectors worldwide. The Fairtrade Certification Mark is your independent guarantee that this product has been traded in accordance with international Fairtrade standards. For further information please visit http://www.fairtrade.org.uk/. VISTA is made up of 100% of certified Fairtrade coffee.